Anyone remember Peter Jackson’s more prescient and subdued efforts? Anyone seen low-budget wonders Bad Taste and Meet the Feebles? Do people even recognise Heavenly Creatures or The Frighteners as being his? His Lord of the Rings and Hobbit trilogies, despite becoming this generation’s biggest hitters, overshadow everything else. Even his between-franchise efforts, King Kong and The Lovely Bones, were smacked with middling responses. Finally, the final Hobbit flick has flown in. This spirited finale concludes Jackson’s topsy-turvy adventures in Middle Earth. Here’s hoping Jackson’s next feature harkens back to his younger, ambitious indie-horror auteur days. The titular five armies are in full force, with our lead characters struggling to find their place. It picks up right where the second installment left off, with Smaug (Beneict Cumberbatch) destroying Laketown. 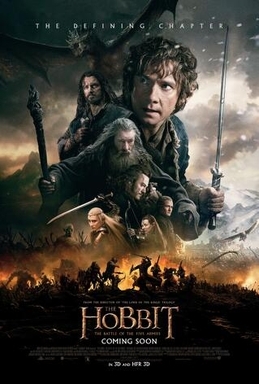 Lowly Hobbit Bilbo (Martin Freeman) and the Dwarf ‘fellowship’ feel responsible for the city’s destruction. Dwarf leader Thorin (Richard Armitage), after discovering Smaug’s immense riches, becomes drunk on power. Meanwhile, Bard the Bowman (Luke Evans), Tauriel (Evangeline Lily), and Legolas (Orlando Bloom) feud whilst looking out for new Orc battalions charging through Dwarf territory. Gandalf the Grey (Ian McKellen) – rescued from Sauron by Galadriel (Cate Blanchett), Elrond (Hugo Weaving), and Saruman (Christopher Lee) – charges into the Dwarvish city to confront Bard and Elvish King Thranduil (Lee Pace). As our five impressive armies charge into Dale, our characters – LOTR alumni and new blood alike – must fight to protect everything residing between Mordor and the Shire. As per the trilogy-capper code, The Battle of the Five Armies shelters a collection of shaky sub-plots, set pieces, and character arcs. Obviously, this installment is not meant for series newcomers. TBOTFA, burying itself in kooky names and stolid exposition, encapsulates everything right and wrong about this trilogy. Jackson’s overblown direction and George Lucas-esque clout drive an arrow through J. R. R. Tolkien’s beloved source material. The uber-successful Kiwi filmmaker, obsessed with his own monolithic creation, pours more filler into this already bloated creation. Adapting mere hints and titters of the original material, TBOTFA’s opening hour – of this 144-minute, shortest-installment-somehow monster – turgidly sets up the seceding hour-and-a-half bloodbath. Certain lines, making our characters look past the camera and over-explain insignificant details, hit like tranquilisers. Sadly, this mixed bag placeholder installment lacks stakes or intrigue. Despite the overwhelming action and tearjerker moments, the original trilogy lingers in the memory banks. No matter how many obstacles Legolas jumps over, shoots, or runs across, we know he will be fine by film’s end. In fact, it makes the fatal mistake of foreshadowing major events from the LOTR trilogy. TBOTFA, despite lacking the previous installments’ pacing flaws, plods from one action sequence to the next — however painfully obvious the CGI is, the action sequences are more exciting and breathtaking than ever. The final third – cutting between one-on-one duels, Bard’s heroic deeds, and Bilbo’s wacky antics – delivers several awe-inspiring visual flourishes and touching moments. In addition, Bilbo’s joyous sense of humour pushes this exhaustive installment along at opportune moments. Rarely does a plucky comic relief become a franchise lead. However, Freeman single-handedly carries this waning franchise. Peppering this franchise with Office-style comedic jabs, his range and charisma distract from his character’s surprising lack of authority or involvement. McKellen, goes without saying, is this installment’s heart. The Veteran thespian, facing up against Bloom and Evans throughout the action, is worthy of immense acclaim. Meanwhile, Armitage and Lily lend more to their roles than the screenplay. Sadly, as far as Jackson is concerned, these people merely exist to extend the trite closing credits sequence. Unquestionably, many people will compare the Hobbit trilogy to the critically derided Star Wars prequels. Indeed, they have similar issues preventing us from fully embracing their CGI worlds and convoluted narratives. The Battle of the Five Armies, despite being the best of this polarising series, pales in comparison to The Return of the King. However, action-fantasy fans will be pleased by the less-gabbing-more-stabbing approach this one offers. Jackson’s return to Middle Earth, despite the nostalgic glow, heads down a road best left untraveled. If anything, everyone has now forgotten about that Lovely Bones debacle. a ratio of four parts water to a single part white cane sugar. through low-cut jeans is both mysterious and tempting. to and you are just extremely fantastic. I actually like what you have acquired here, certainly like what you are saying and the way in which you say it. This is how I started out plus it would have been a great start in your case as well. lose fat quickly you do have to eat less. fat reducing metabolism, which likewise helps you lose weight. room. For beginners, it is strongly advised to come up with a plan before using Google Ad – Words because this method involves monetary investment. could lead to a higher search engine ranking, and they started to exploit that.